​Anne Tryba has created visual art from a very early age. At 16, she taught children’s art classes, and went on to get her Bachelor of Fine Art from Cardinal Stritch University. Since then, she has participated in group and solo exhibits, and worked professionally as a graphic designer and design manager. 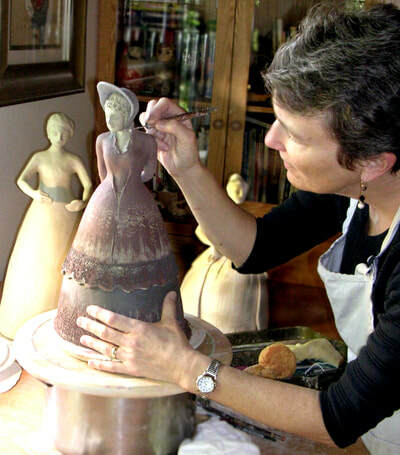 Her personal artistic expression in the last 15 years has focused on sculptural ceramics and mixed media assemblage. A Disney Imagineer for more than 25 years, Anne designed graphics for all of their theme parks, and was the manager of the WDI graphic design department for 7 years. She continues to work as a consultant for theme parks and museums. Anne has contributed to books and articles on design and creativity, including The Imagineering Way and The Imagineering Workout, Signs of the Times, How, and Graphic Design: USA magazines. Her work has been published in Print Casebooks 8: The Best in Environmental Graphics, Signs and Spaces, and Urban Entertainment Graphics. For many years, she was president and treasurer of Women in Design-Los Angeles, and the design chairwoman for the international Society for Environmental Graphic Design Awards in 2000. She has contributed countless volunteer hours over the years to local causes including the designs for the permanent “Be Aware-Drive with Care” signs installed in 2010 by the City of La Cañada. Anne is currently a member of the Angeles Crest Art Guild. She has exhibited work previously at the Boston Court Performing Arts Center gallery, the Modest Fly Gallery in Tujunga, and the La Cañada-Flintridge Community Center.